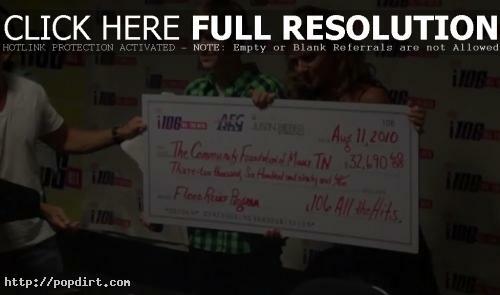 Justin Bieber was on hand for a Nashville Flood Relief press conference with i106 on August 11th, which was hosted by Bert Weiss from Q100’s The Bert Show. “I’m really glad to be here and help out something that’s really important to me,” Bieber said. “Music has been a part of my life as long as I can remember, and Nashville, there’s so much music history here. So I just wanted to donate $1.06 from all my tickets to the flood victims and help out a little bit. It came out to somewhere about $16,000, and AEG decided to match that. We came close to $30,000, so that’s gonna help out a lot.” Watch footage of the press event via YouTube below the cut.